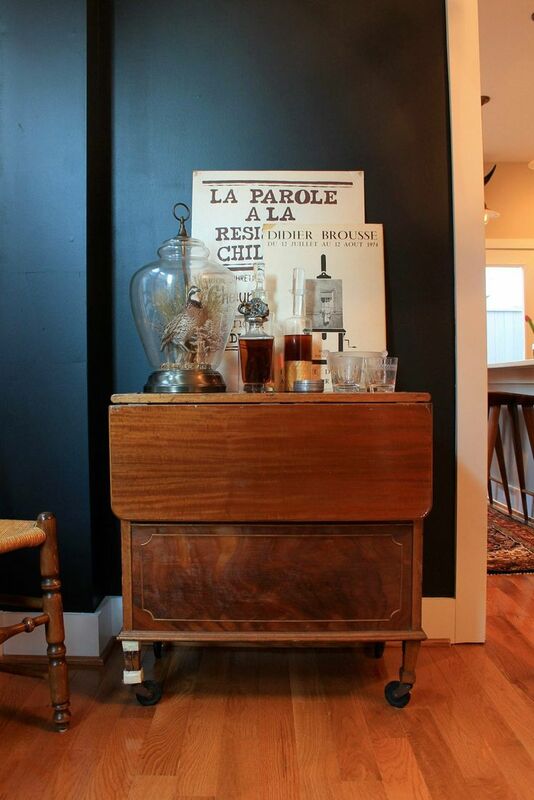 Vintage bar carts are an easy way to organize your drink collection and an awesome way to display them around the house. Once you have your bar cart, what do you store on it (besides the obvious personal selection of liquor)? 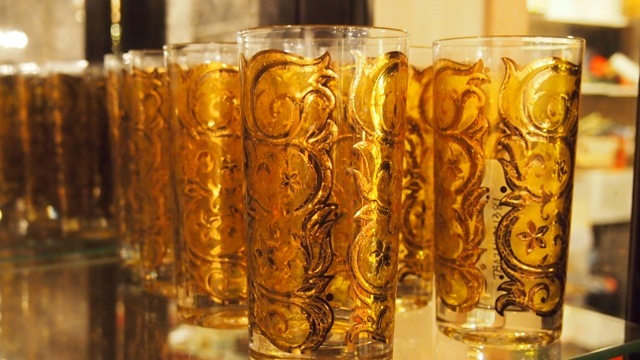 We have a few ideas that we consider essential for every bar cart. 1. Your bar cart is set up with a selection of liquors and mixers but preparing a proper cocktail is whole separate issue. This is why we have to recommend The Art of the Bar to both seasoned drinkers and newbies. 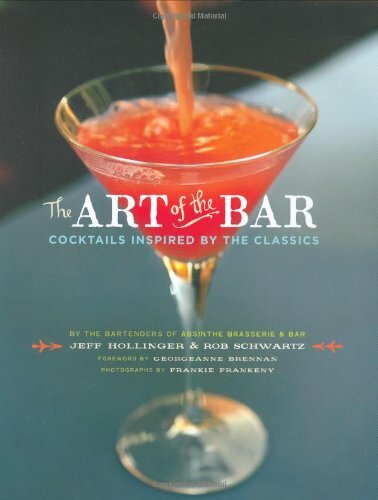 This handy book features a wide variety cocktails, both classic and new, from the talents of seasoned bartenders Jeff Hollinger and Bob Schwartz. 2. You have your liquors, you have your mixers, you have your garnishes, and the recipe to put it all together in a powerful cocktail. 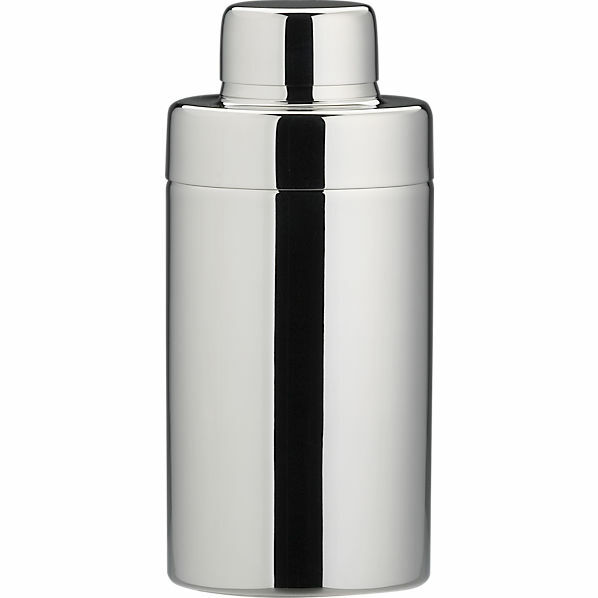 Now, you need to mix it together and what better way to do is than in a shaker? If James Bond prefers his cocktails shaken, not stirred, then maybe there’s just something to that method. 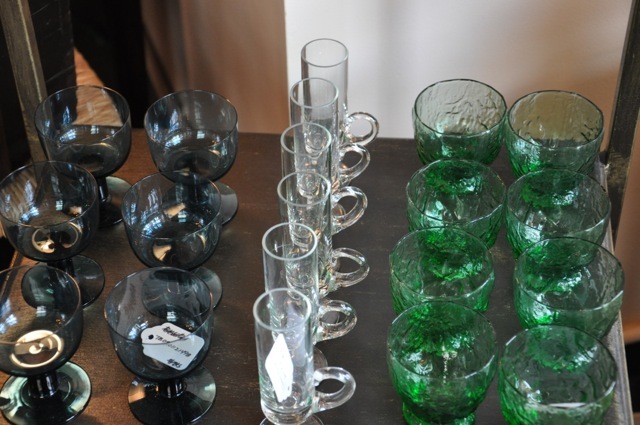 We love a great vintage bar set and regularly stock shakers and all accessories! 3. Before you go ahead and pour yourself a drink all willy-nilly, perhaps you should consider letting it breathe first. 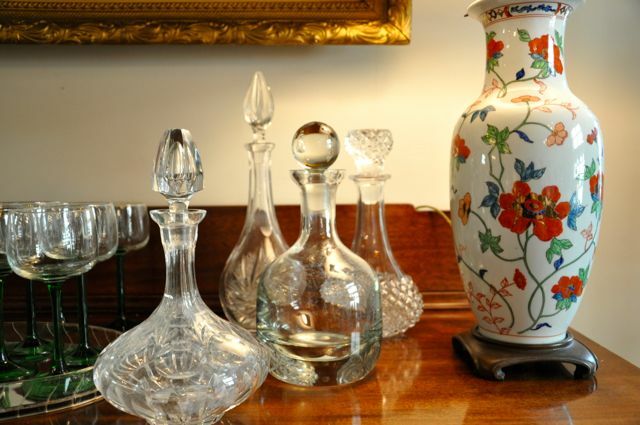 In the case of wines, cognac, and single match Scotch, a decanter can go a long way to helping you enjoy your beverage by infusing oxygen into it through aeration. Not only will your drink taste better but it just looks cool. 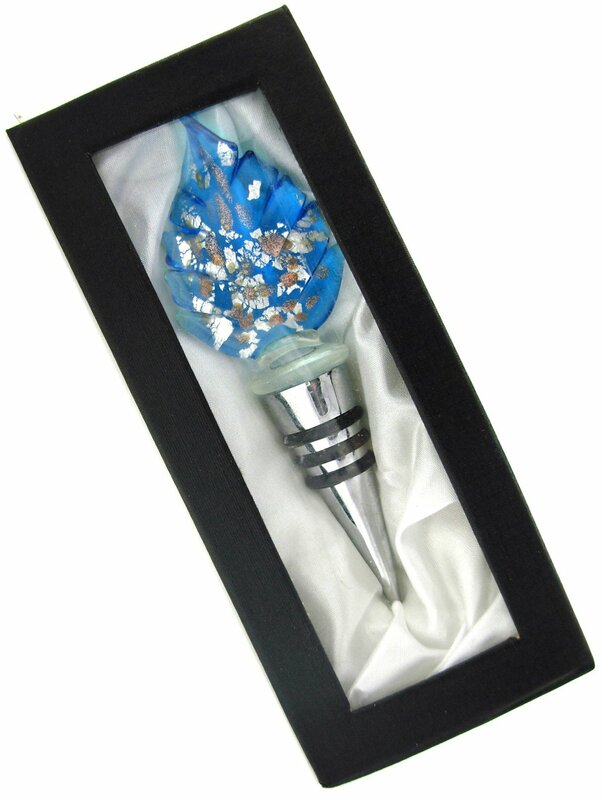 Speaking of looking cool, if you have a thing for cut crystal, we have the perfect decanter for you in the store. 4. When mixing a cocktail, having the proper tools can make that job a lot easier and a lot quicker. 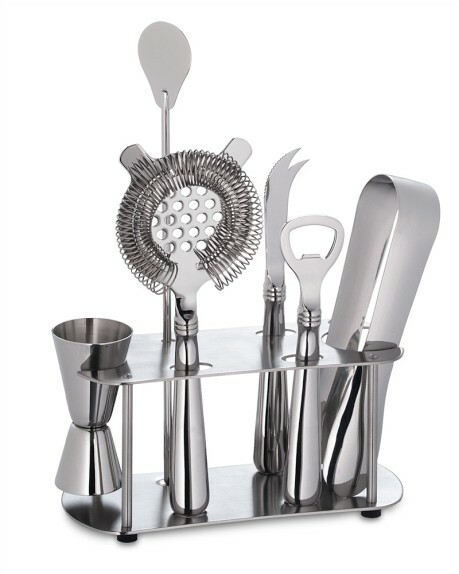 Open those bottles with ease, stir with reckless abandon, and garnish like the best of them with these handy bar tools. You’ll look like a proper bartender in no time. 5. Those cocktails are going to need ice and you don’t want to be running back and forth from the cart and the freezer. 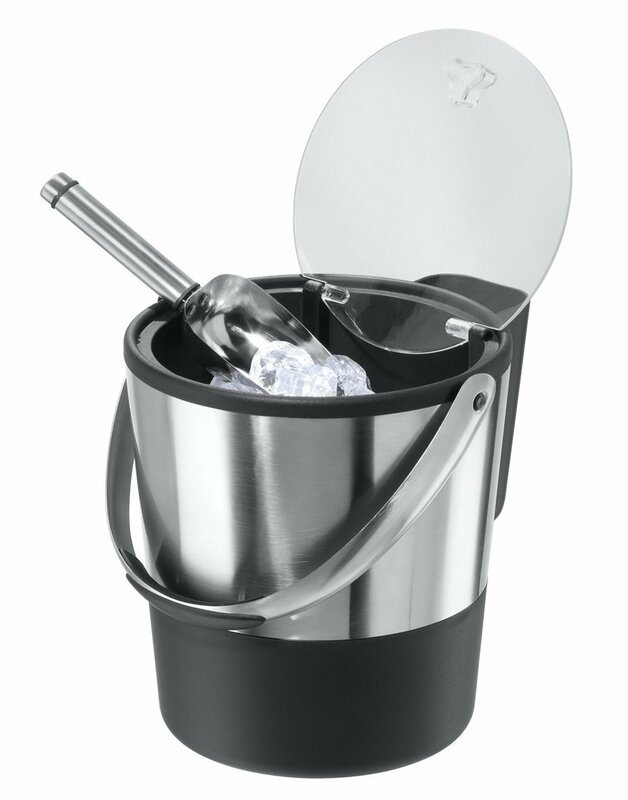 You’ll need to make sure you have yourself an ice bucket to keep that ice close and ready for serving. 6. 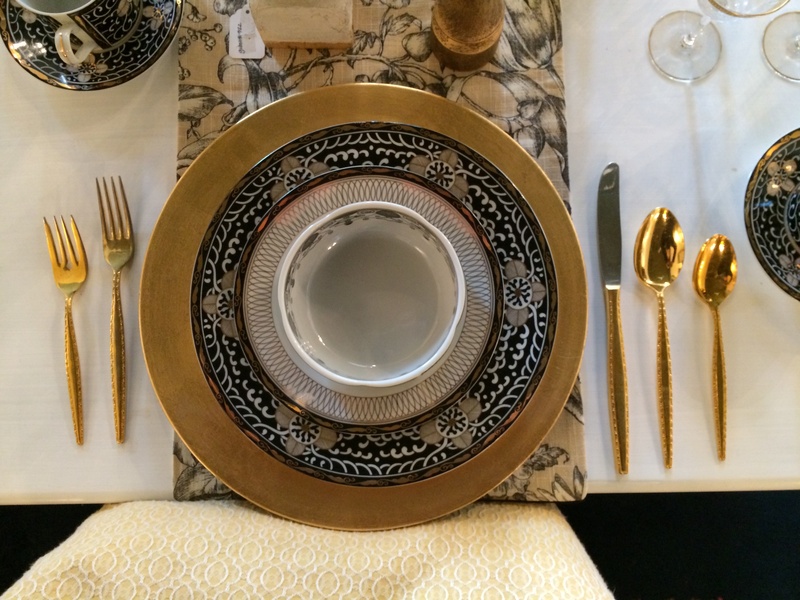 Don’t forget about glassware! What else are you going to serve your drinks in? There’s a large variety of glassware you can choose from and you’ll need lots of different kinds for all the different drinks you’ll be making. If you’re not sure what kind to get, read our blog post “Drinking in Mid Century Modern Class” for a breakdown on the different types of glassware and their uses. 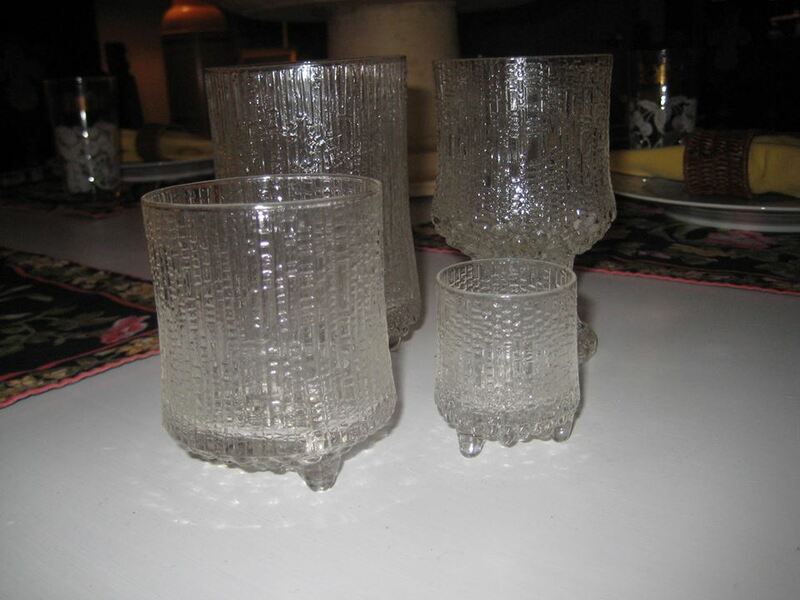 We also have Iittala glassware from Finland. The Ultima Thule line, inspired by melting ice, has been around for almost 50 years. We just came into a huge collection of it. Come on by and see it! 7. And lastly, you’ll need to invest in some bottle stoppers to keep your selection from going to waste. They look great and are functional too. Having a handful of these should help make your collection of liquor last longer and look great. It might be time for you to get a watch. Or better yet, a vintage clock! We have a selection of vintage clocks in the store to choose from and all are in fantastic working order. We love to see these beautiful creations of science and handcraft gracing the tops of mantels, displayed between antique books in curated bookshelves, or hung on walls in living rooms, to mark the time. Here are some of our favorite vintage clocks in the shop. 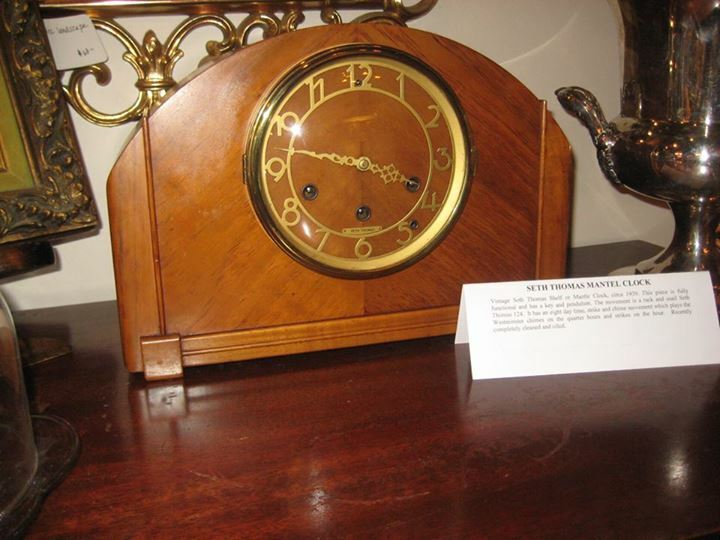 This is a wonderful Seth Thomas mantel clock with Westminster chimes. The art deco details are flawless. 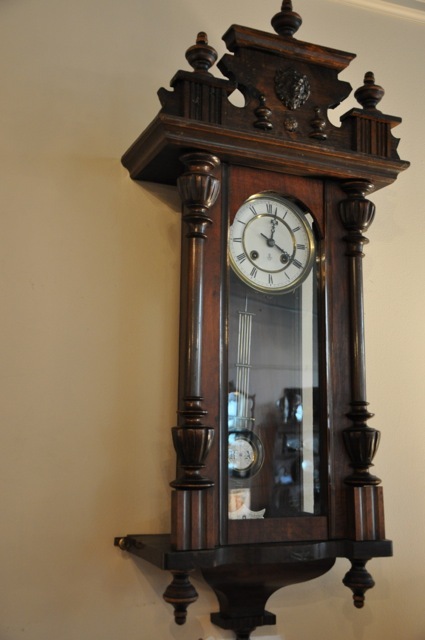 This beautiful antique English clock is from circa 1890 and is encased in rich wood with incredible patina. 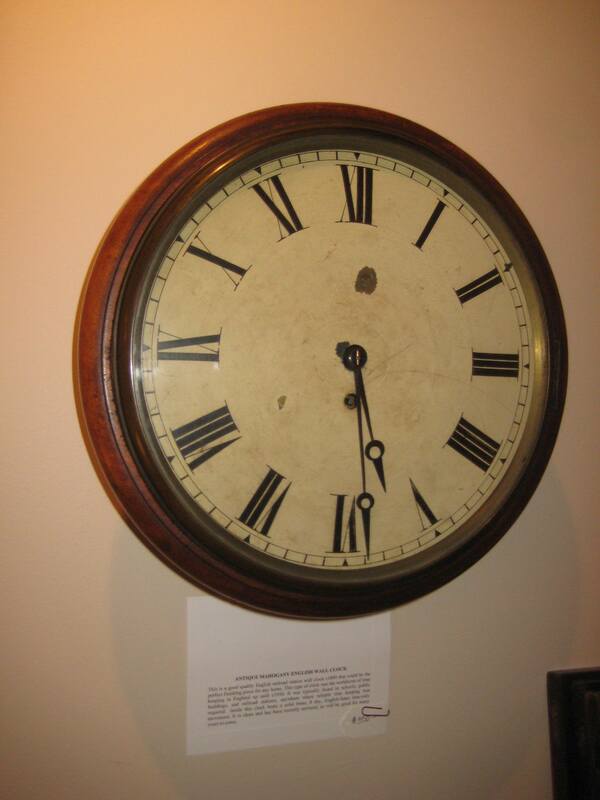 These are the clocks you would see in public buildings, rail stations, and schools. 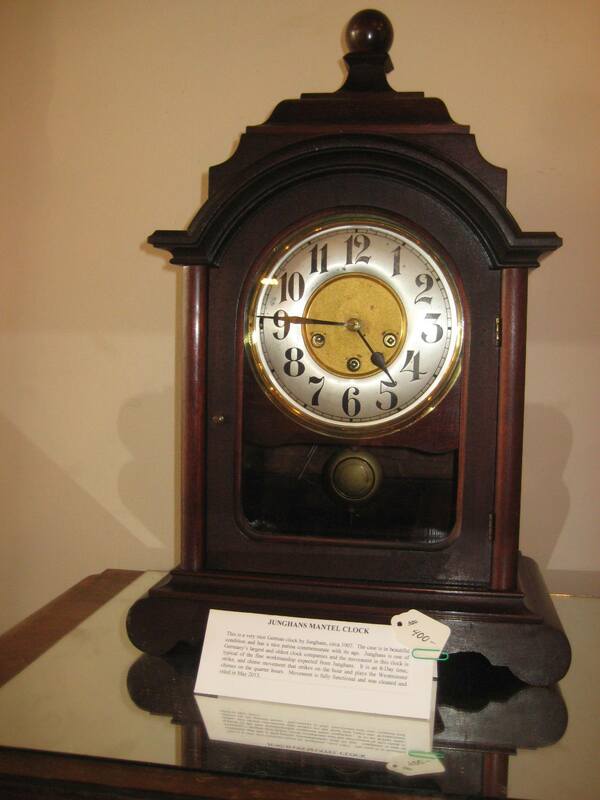 This antique Junghans mantel clock is from circa 1907. Jungans is one of Germany’s largest and oldest clock companies. It is a beautiful clock with Westminster chimes. This antique wall mount clock is has beautiful hand carved details. Do you know what time it is yet? Have some vintage luggage sitting around the house and haven’t bothered to use them for travel? Don’t just let them sit around. 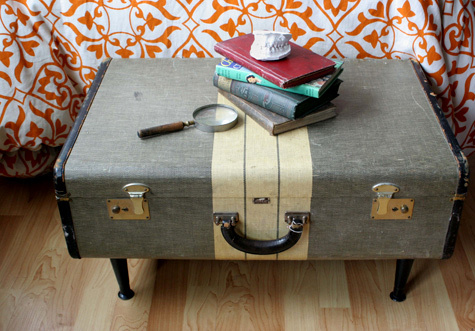 You’re in luck because one of the hottest trends coming up in 2014 is taking that boring old vintage luggage and putting new uses to them. 1. Turn it into a coffee table. Attach some legs onto it and place it out in your living room. You’ve instantly got a functional and fashionable coffee table to place your coffee table books on top of and your miscellaneous living room items within. 2. Take is a step further and turn it into a beside table. You can attach longer legs or place it on top of a suitcase stand. It’ll help liven up that bedroom and add a little bit of flare. 3. Speaking of beds, turn one into a bed for your cat (or small dog). As the Internet has found out, for some reason, cats just love boxes. 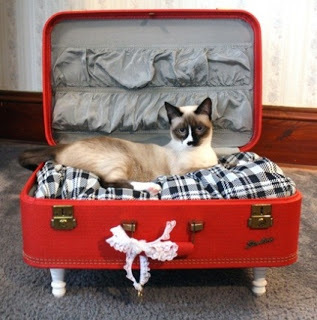 Whether it’s sitting in them, sleeping in them, or playing in them, they find boxes irresistible, so turning some vintage luggage into a bed is sure to please your feline friend. 4. Turn it into a chair! 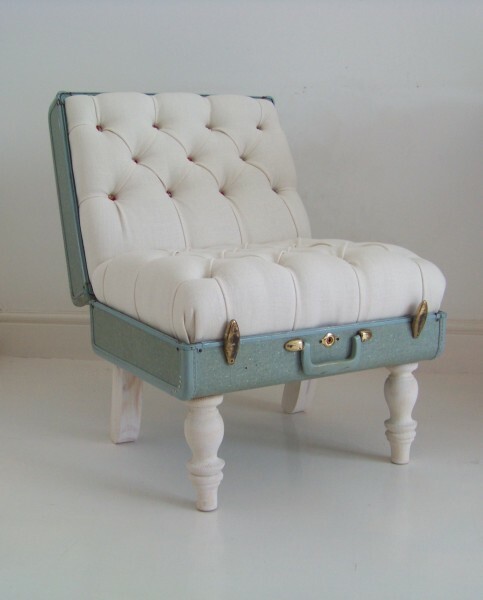 With a little bit of work, you can take that piece of luggage, attach some legs, add some cushioning and you’ve got yourself a fashionable piece of furniture to have in any room. 5. Turn it into shelving. 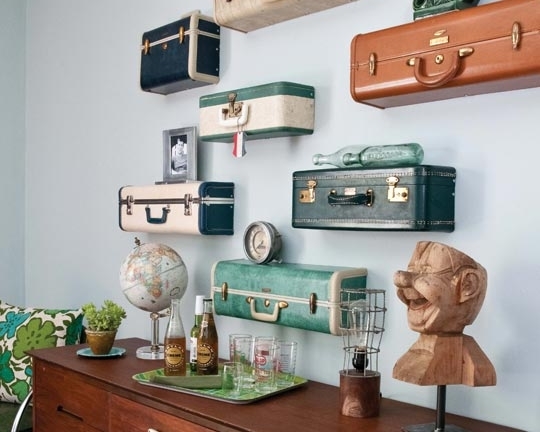 With a little bit of precision cutting and placement, you can turn your vintage luggage into awesome shelving that will look several steps up from plain wood shelves. 6. Turn them into drawers! 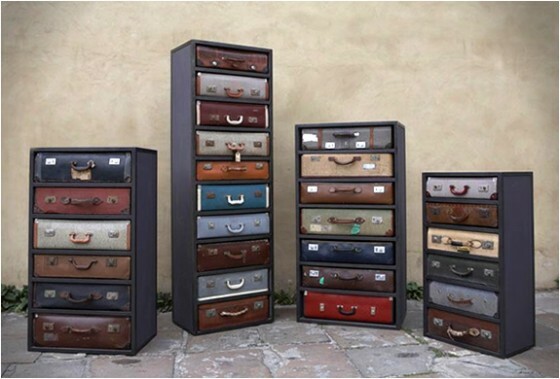 If you’ve got some luggage that is similarly sized and some woodworking skill (or know someone who does), you can turn your luggage into some fancy looking drawers. 7. 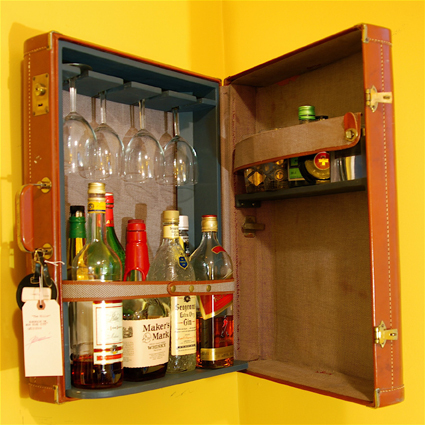 Turn it into a suitcase bar. With a few additional pieces of molding, you can easily turn your luggage into a suitcase bar that your guests will most definitely talk about. It’ll keep all your drinkware nice and tidy and store your liquor safely. 8. Turn it into a medicine cabinet! 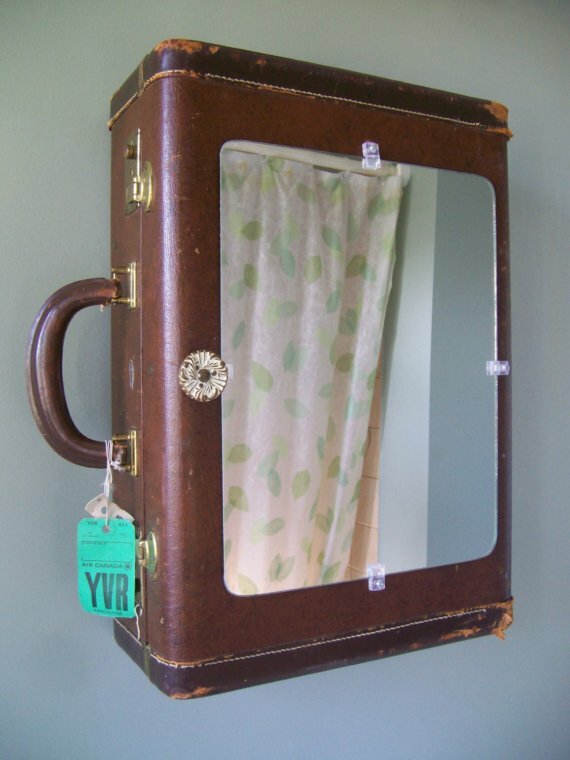 If your bathroom currently doesn’t have one, you can easily make one with your old vintage luggage, a mirror, and a spot on the wall you can attach it to. You can even add some shelving inside to organize all your items. 9. Turn it into a boombox. 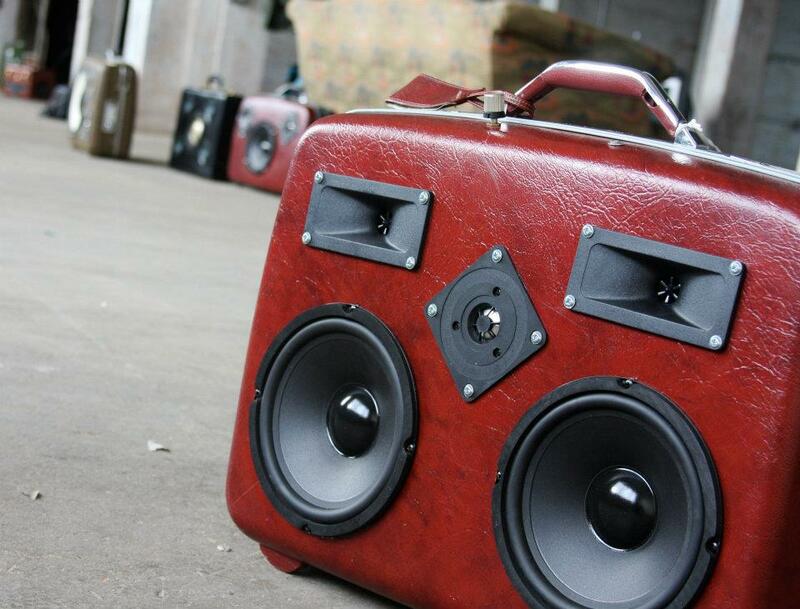 If you’ve got some electrical know-how and the patience to put it together, you can turn that piece of vintage luggage into a fashionable boombox to lug around to parties! Take that music with you and look good doing it. What Are You Looking for in 2014? 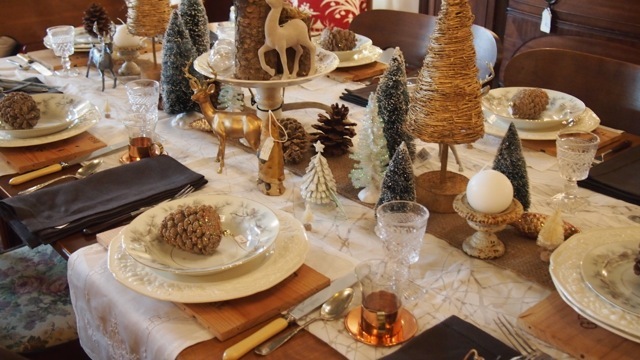 We, the designers and collectors responsible for stocking Gracious, want to know what you, our beloved customers are looking for this year! 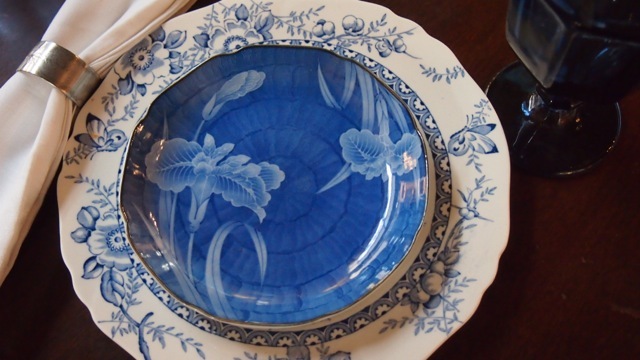 Perhaps a new look for your dining room? 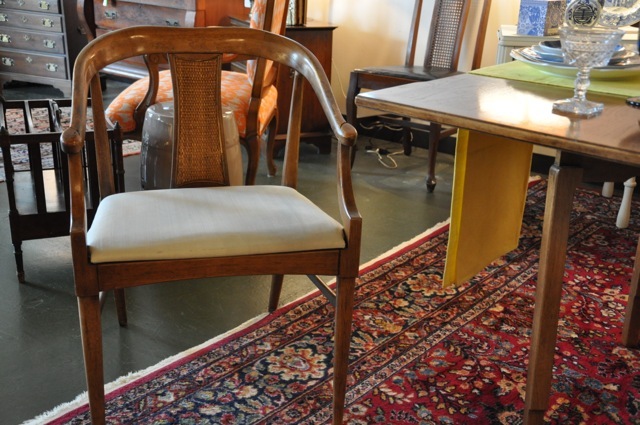 Are you interested in new dining room chairs to spice up your look, or new china to adorn your table? Let us know your color schemes and counts! Maybe interested in some vintage barware? 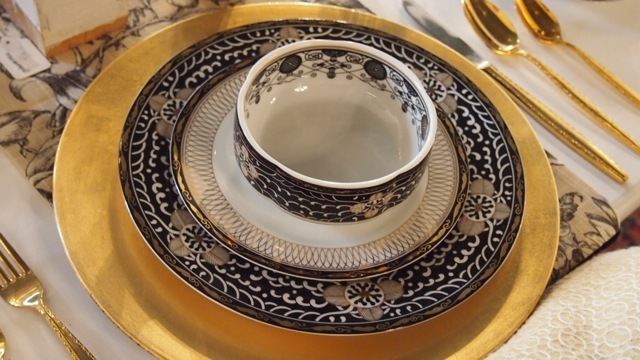 Or stunning new dishes? 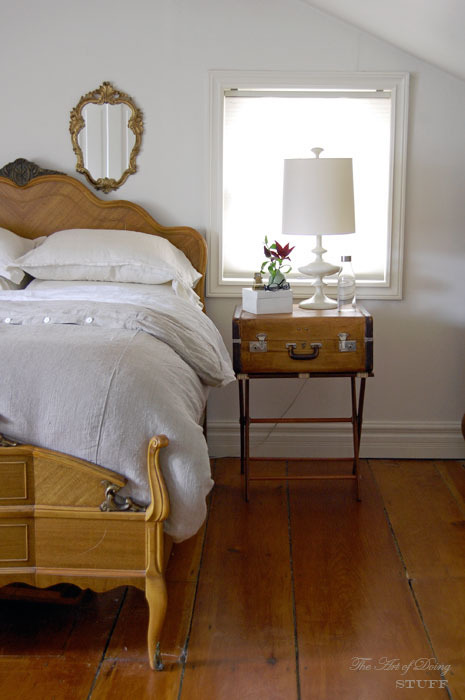 Maybe this is the year you’ve decided to replace your “placeholder” furniture, whether a chair, a rug, a table, or a lamp, with the perfect piece, one that is sized correctly and fits your style. Are you mad about mid-century modern? Is your den an homage to Donald Draper? Are you looking for a mod credenza for your posh pad? 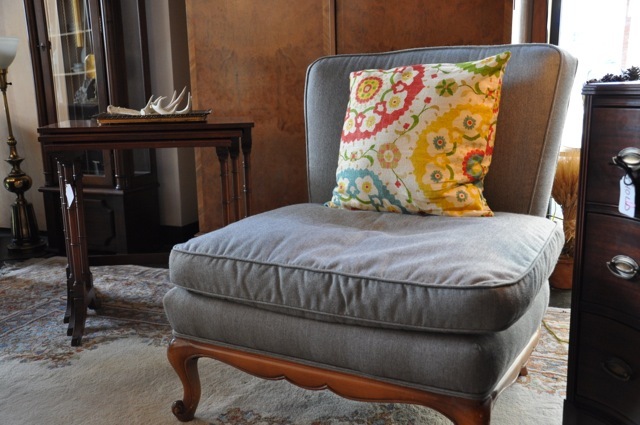 Perhaps you’re looking to freshen up your living room with some new chairs? Some accent colors? Some new throw pillows? Our New Year’s resolution is to continue to find the most beautiful vintage, stylishly repurposed, and upcycled furniture for your homes! Let us know what you are looking for this year, and we’ll be sure to find it! 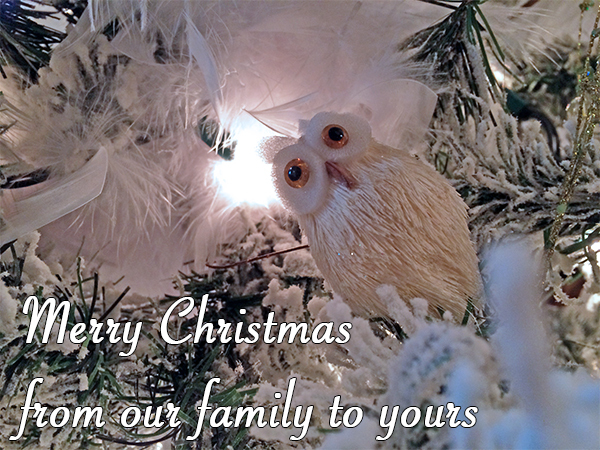 Wishing you a very Gracious Merry Christmas! Ever have one of those projects that you’ve been dying to see done, but for some reason, you never get around to it? This lantern is just that project. About two and a half years ago, I arranged to meet with a man in the parking lot of a far off grocery store. He had a lantern that I wanted to look at. I use the term “lantern” lightly because what he really had was an idea of a lantern; old, decrepit, bent, and in pieces. Of course, I fell in love with it. I actually paid him for the honor of taking these bits and pieces of lantern home with me. It wasn’t until a few days later, after having a lovely dinner, that I told my husband about the lantern. 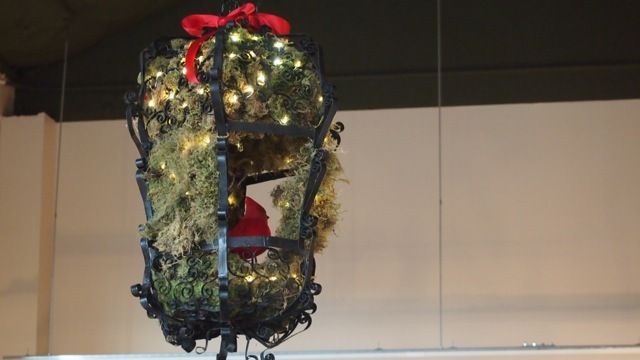 I wanted him to help fulfill my vision of it being filled with moss and white lights and get it ready for the store. It is a credit to the patience and love that my husband has for me that after more than 20 years of hearing about my “visions,” he did not immediately throw out the bits and pieces of lantern upon seeing the condition it was in. 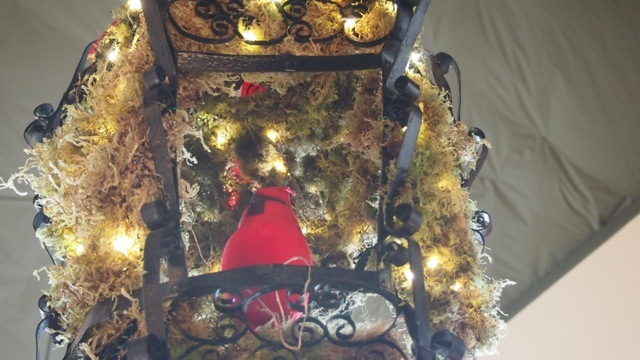 Instead, on a Sunday afternoon where he could have been home watching football, he helped install the moss covered lantern with fairy lights in the shop. He also put the crowning touch to finish my vision. A red cardinal right inside. 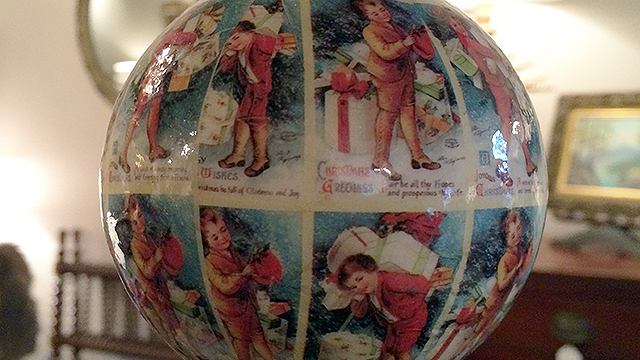 Christmas is right around the corner so the window for gift shopping is closing up quickly. With that in mind, we wanted to lend a hand to the shoppers with gift guide for those looking to find the perfect vintage item. 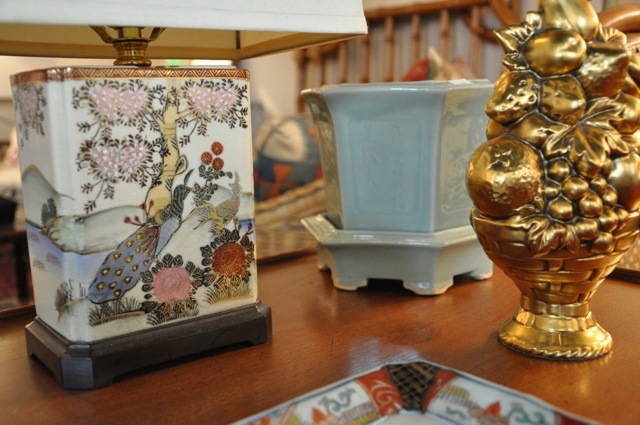 We have many great items in the store that are perfect for gifting. 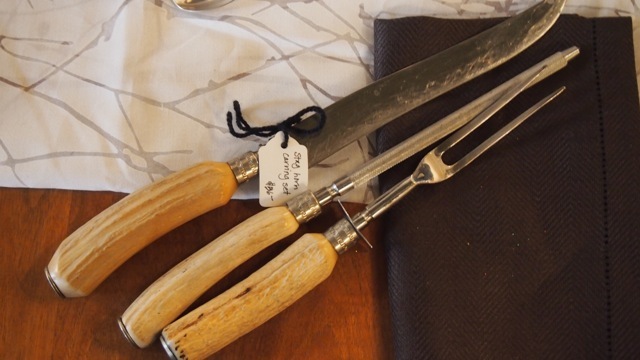 Cut the turkey in vintage style with this great turkey carving set. 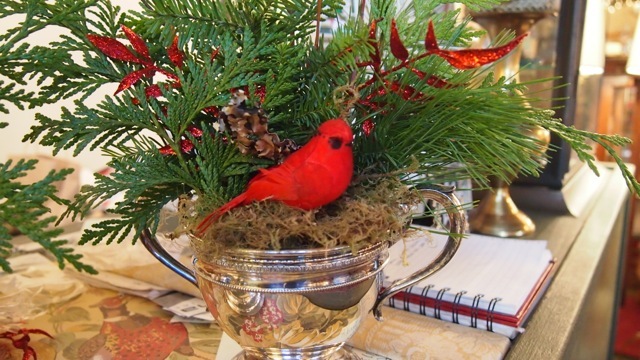 Put a bird on it with this great custom centerpiece made with vintage silver and fresh greens, arranged by Gracious. 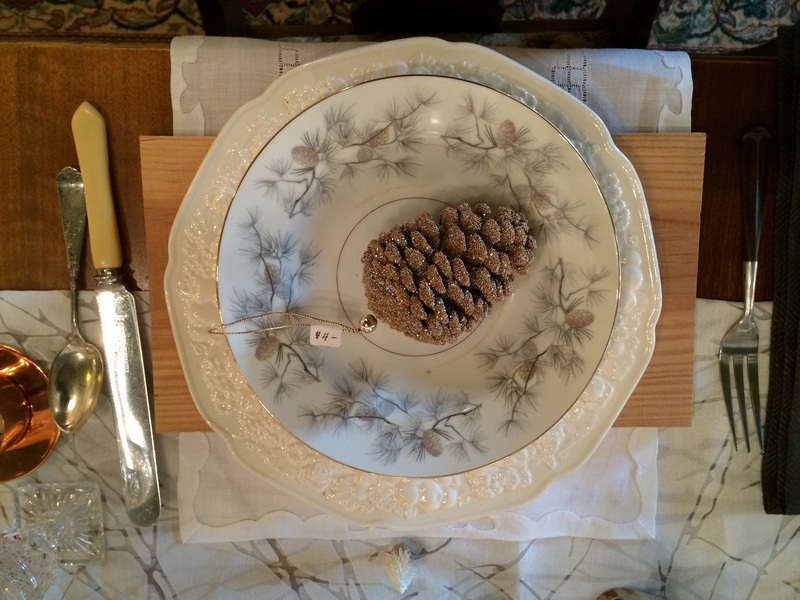 Need a centerpiece for your Christmas dinner? This reindeer instantly sets the theme. 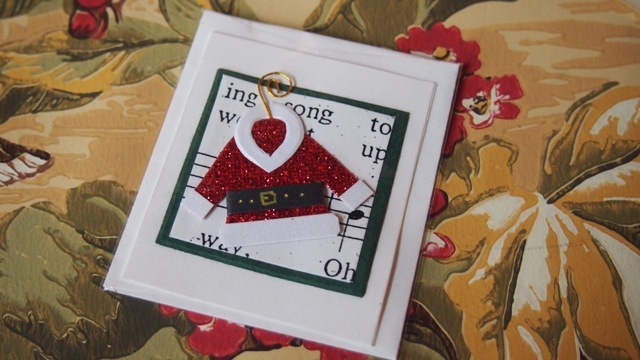 These vintage Christmas cards are great to send out this season! 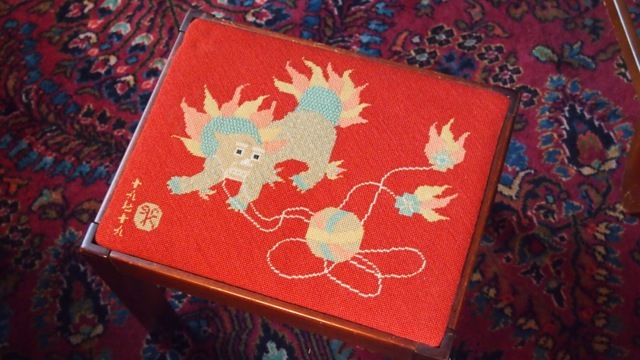 The stitching on this stool is incredible. 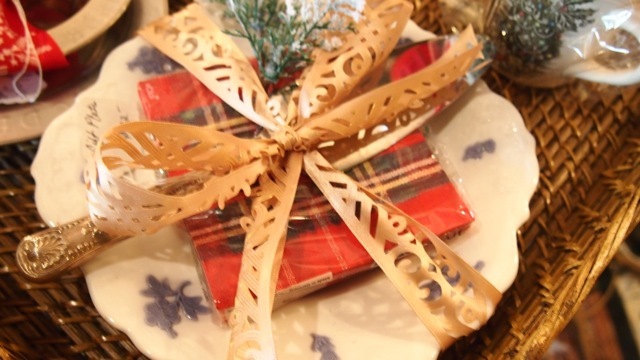 Our party gift bundles are perfectly packaged for the hostess of the holiday parties you will attend. 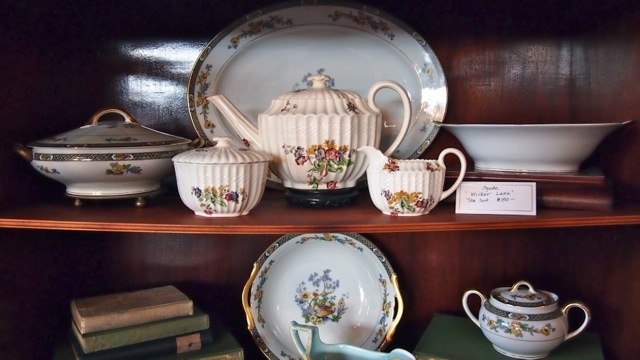 This vintage tea set is great to help warm up during this cold weather. 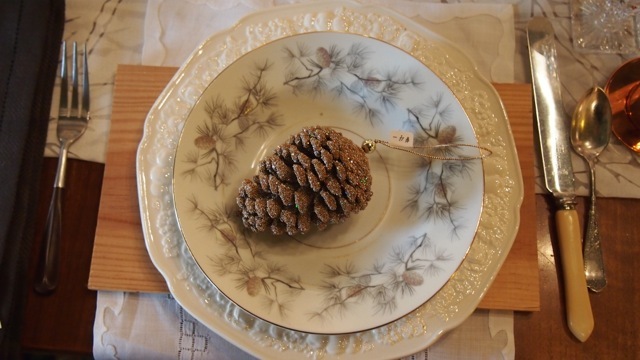 Vintage ornaments that would look great on any tree. 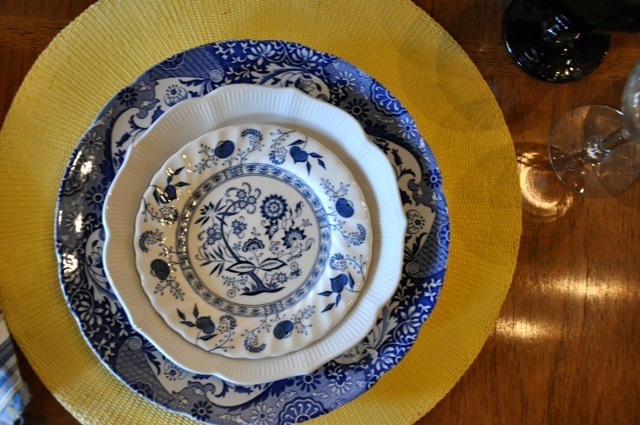 Gracious also has many items to help you prepare your holiday table. 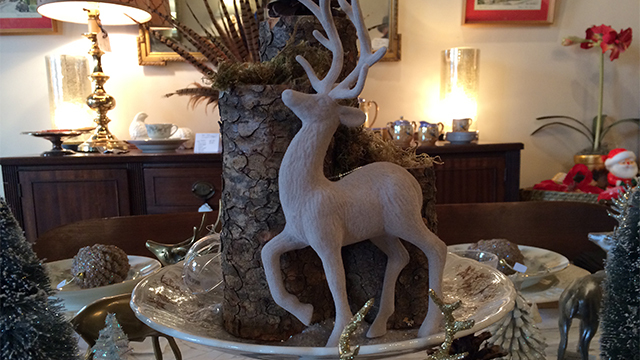 Come in and see our many displays for ideas! Don’t forget about your holiday drink! 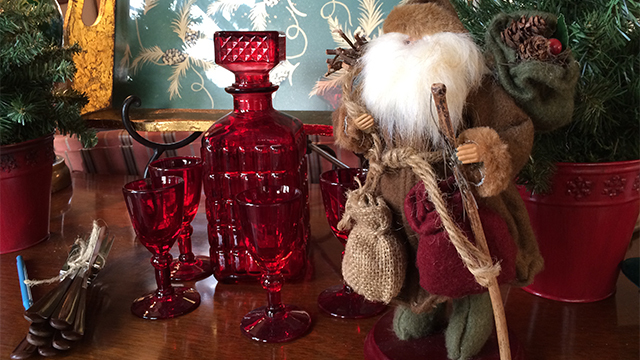 We have plenty of vintage barware available to fit any type of drink you’ll be serving. Looking for more gift ideas? Come in to the store and let us help you pick out the perfect gift for the holidays. Thanksgiving is upon us this week. 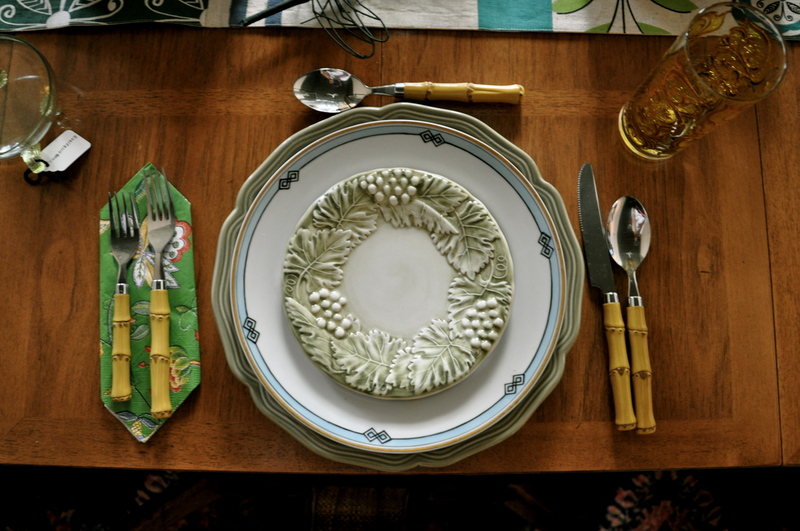 While we’re all anxious to sit down and start dining on all the delicious food, there are some things you should know about dinner etiquette. Luckily, we found the perfect helpful guide to help you out this Thursday.